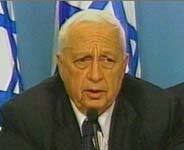 Israeli Prime Minister Ariel Sharon in a televised news conference early Friday after an all-night Cabinet session. Sporadic gunfire can be heard as Israeli forces enter Ramallah today. Israeli armored vehicles headed into the West Bank at the Pasgat Zeev checkpoint on Thursday night. JERUSALEM, Friday, March 29  The Israeli government declared Yasir Arafat an "enemy" today and sent tanks and armored personnel carriers to fully isolate him in his Ramallah headquarters and to launch an "extended operation" in the Palestinian territories. After an all-night meeting of his cabinet and flanked by senior ministers, Prime Minister Ariel Sharon recalled the deadly suicide bombing of a Netanya hotel on Wednesday night as well as two subsequent terror attacks. He said Israel had extended its hand in peace, "but all we get back in response is terrorism, terrorism and more terrorism." "No sovereign state can ignore such a sequence of events." He said 20,000 reserve soldiers were being called up to free regular forces for an operation that could last a long time. By the time Mr. Sharon spoke, a heavy force of Israel armor was already on the move in Ramallah, the unofficial Palestinian capital. Officials in Mr. Arafat's compound said tanks and armored personnel carriers had fully ringed them and bulldozers had breached a hole in the wall. Gun battles broke out between the Israeli troops and Mr. Arafat's guards. Benjamin Ben Eliezer, the minister of defense, followed Mr. Sharon to the podium and declared that the operation had begun in Ramallah, "the capital of terror," but would continue elsewhere. "Nobody is immune to the armed forces as long as that person is labeled a terrorist," he said. The new explosion of violence also followed an Arab summit in Beirut which had adopted a Saudi initiative offering normal relations with Israel if it pulled out of all occupied territories. That declaration, which the Bush administration had actively supported, now seemed effectively superceded by events. And some Middle East observers saw the Arab League offer as a mixed message, encouraging the Palestinians to keep fighting. The operation effectively put an end, at least for the duration of the incursion, to the efforts by the American envoy, Gen. Anthony C. Zinni, to mediate a cease-fire, and opened a new and potentially vicious chapter in the violence that has wrenched the Middle East for 18 months now. After an extensive operation in Palestinian areas early this month, Israeli tanks and forces pulled back when General Zinni began his mission. This time, however, Mr. Sharon repeatedly said the operation would be "long, drawn-out and protracted." From within Mr. Arafat's compound, Nabil Aburdeineh, a senior aid to the Palestinian leader, said by telephone today that the operation marked a "declaration of war" against the Palestinian people, and called on the United States to call off the Israelis and to isolate Mr. Sharon and his government. Mr. Aburdeineh said Mr. Arafat was in charge, and was telephoning leaders around the world in search of support. The military operation followed one of the most severe terror attacks of the latest uprising, when a suicide bomber detonated a massive charge in a Netanya hotel filled with Israelils celebrating the Passover Seder. Twenty-one persons were killed. On Thursday, another Palestinian gunman shot and killed four Israelis in a Jewish settlement near the West Bank city of Nablus, and this morning another Palestinian was reported to have infiltrated a Jewish settlement in Gaza, killing two people. In the wake of the attacks, and with an Israeli retaliation imminent, Mr. Arafat issued a statement saying he was willing to immediately start implementing an American cease-fire plan without conditions. But Mr. Arafat stopped short of actually declaring a halt to hostilities, and Israelis dismissed the statement. There was no immediate reaction from General Zinni. Throughout Thursday, Mr. Arafat had come under pressure from many quarters to agree to a cease-fire. Aides said he had received calls from the foreign minister of Germany, the secretary general of the United Nations, the commissioner for foreign affairs of the European Union and the government of France, among others. Nonetheless, at a news conference Thursday night, Mr. Arafat chose language that fell short of actually putting a cease-fire in place. He rejected the draft cease-fire agreement under discussion with Gen. Anthony C. Zinni, the American special envoy, and indicated that he wanted to remove several conditions that the Israeli government had added. That will undoubtedly require much negotiation. "We are ready to start implementing immediately the Tenet work plan without prejudicing any of its articles," Mr. Arafat said, referring to the cease-fire plan drafted last year by George J. Tenet, the American director of central intelligence. He added that "there are ideas" that have been added "that are not from Zinni." Mr. Arafat was referring to Israeli modifications to the plan, like the removal of a ban on "proactive attacks" on Palestinian civilian targets. The State Department spokesman, Richard A. Boucher, reacted cautiously to Mr. Arafat's remarks. "We've seen the statement," he said. "We've noted what he's said. We continue to work with both parties, and the focus needs to remain on carrying out the specific steps to reduce the violence and implement the Tenet understandings." The death toll from Wednesday night's suicide bombing rose to 20 on Thursday and could rise given the number of seriously wounded remaining in hospitals. An unidentified senior Israel official, quoted on the nation's main midday radio newscast, called the bombing at the start of a Passover in a hotel dining room in Netanya "a declaration of war against Israel." Mr. Gissin said Israel was giving Mr. Arafat one last chance to act to "stop this crazy, stupid butchery of Israeli civilians." He said, "This is his last moment, a moment of truth for him and his people." Late Thursday, Palestinians said the Mr. Arafat's security forces had started arresting Islamic militants of Hamas and Islamic Jihad in Ramallah, Bethlehem, Hebron and Nablus. At the same time, some 600 pro-Palestinian foreigners, including the French farmers' union leader, José Bové, arrived in Ramallah to offer themselves as human shields for Palestinians. "We are going to stay here in Ramallah in particular to provide the Palestinians with protection," Mr. Bové said. On Thursday afternoon, the army moved into the Gaza Strip and divided it into thirds to make travel between the sections more difficult, both for terrorism suspects and for ordinary people. With that tension in the air, the Israeli government reacted negatively on Thursday to the peace overture from the Arab summit meeting. On Thursday afternoon, one Israeli government spokesman called the proposal a "nonstarter." Another called it "an important and interesting initiative" deserving of further study. Mr. Sharon, in an interview published in the newspaper Yediot Ahronot on Wednesday, was more explicit. The plan was well known then, but the Arab nations had not yet endorsed it. "A return to the 1967 borders will destroy Israel," he said. "The entire world is talking about the Saudi plan; everyone enthusiastically recommends endorsing it, and the only one that no one asks is Israel. No one!" Thursday was a national holiday in Israel, for Passover, so most government officials were not working. 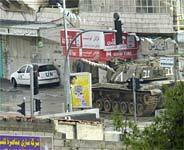 But in Ramallah residents were furiously getting ready for a siege. "There is a lot of talk all over Ramallah that there is going to be a reoccupation, and this time the Israelis are going to stay a long time," said Salah Hanienett, who like many residents was stocking up on groceries. "We think they will arrest a lot of people, collect a lot of weapons, just to make propaganda." Gideon Ezra, Israel's deputy minister of internal security, said he believed that the country should set up detention camps for Palestinians caught with illegal or improper papers. Those people, he said, are potential terrorists. At Mr. Arafat's compound, most buildings stood empty; workers had fled. An ambulance was parked outside, standing ready. Mr. Arafat was still inside and gave his news conference from there. Two uniformed soldiers stood guard at the entrance, warming themselves by burning scrap lumber in a tin can. They seemed very much alone. "We expect something to happen soon," said Nidal, one of the soldiers. Nearby, shoppers were mobbing Tayseer Habib's vegetable stand. "Usually I sell in one week what I have already sold today," he said. "People didn't prepare the first time Israel invaded," he added, referring to an incursion early this month that lasted several days. "But this time they are planning for a siege, and when I carry the boxes to people's cars I see they are full with cans, sacks of rice, other things."